I have a good sized piece of property. As I get older, it seems to get even larger when it comes time to mow it with a push mower. Doc says the exercise is good for me. But then, he ain't the one doing the pushing. With all that space, I ended up with a very small front lawn. It could easily look cluttered. I already have enough clutter in the back. I think clean lines are best for a small lawn. I started with a sloping eyesore and turned it into a near perfectly level lawn. It looks good. I left just enough pitch for drainage, but it still looks level. 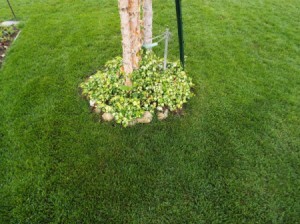 Rather than raised beds adding broken lines, my flower beds are sunken and don't interrupt the lines of the lawn. They are kept small and to the edges of the lawn. That pretty much leaves me with an empty lawn. I wanted a focal point. Due to the small size of the lawn, I was very limited in choosing trees. Maybe a myrtle or a Japanese maple. I decided on a river birch. The river birch is a small tree and is interesting all year round. I like the way the old bark is continuously shedding and makes paperlike curly ques on the trunk all year. A clump of three will be reduced to one, out of necessity. And restraints will be removed. A ring of flint rocks filled with a variegated ivy and I have what I think is a simple yet interesting focal point for a small lawn. And I have kept the lines quite clean.